Twenty years on from their platinum selling album Sumo hitting number two on the ARIA Chart (and with a few ARIA Awards in the trophy cabinet), The Superjesus are back with an anniversary edition of their celebrated 1998 debut, set for release on Friday 17th August. 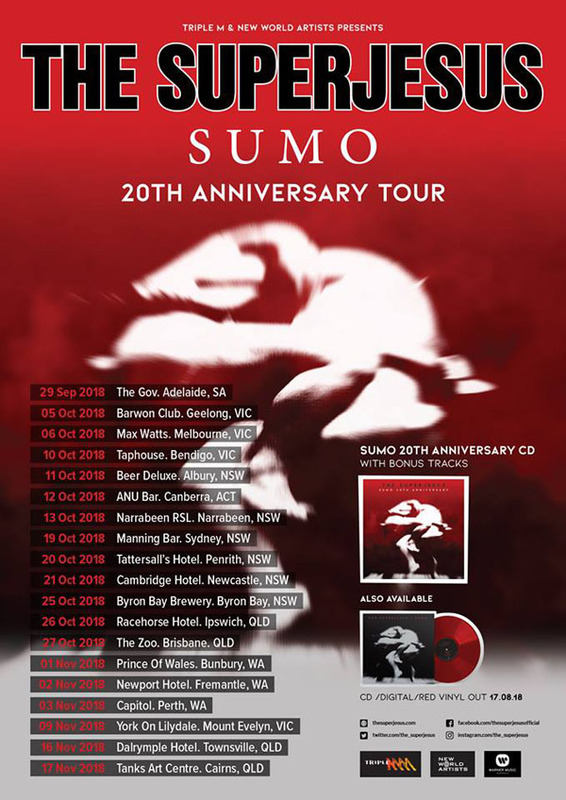 As well as seeing the original album reissued on vinyl, the CD edition of Sumo – 20th Anniversary features bonus material sourced from triple j’s Live At The Wireless archive, as well as a never before heard studio recording: a Superjesus cover of Kylie Minogue’s Confide In Me. The Superjesus will be hitting the road with an epic stack of gig dates in the second half of 2018 - fans had better get ready to get Down Again to the sounds of Adelaide’s finest ‘90s alternative rock band! Sumo – 20th Anniversary Edition CD and a limited red vinyl pressing of the original album will be out Friday 17th August.